my brief radio hiatus ends just in time for the holidays! 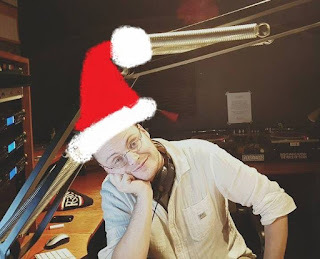 the organ grinder christmas special, wherein i help santa claus conduct an intensive interview of prospective north pole organist ross nicoll, airs on wednesday, december 19 at 1 pm and will pop up again at various times during cjsr's holiday loop the following week. my wife caitlin richards also returns this week with her first new imaginary landscapes since fundrive (tuesday, december 18 at 8 pm.) that bell-themed holiday special will likewise be a part of the holiday loop. so much Christmas spirit, you're sure to replace your regina pats toque with a crudely-drawn santa hat, much like me (pictured).